Merry Christmas from Being Carter Hall! Have a fun and safe holiday! I headed up to Charlotte yesterday, meeting up with my Green Lantern-obsessed friend Joe and general comics lunatic Adama, and we hit the Charlotte Comicon. All told this was a great little trip, and this is a fun small one day Con. It's worth the trip up to Charlotte if only because it means I get to visit with my friends as well. Plus, it's always nice to pick up some new Hawkman swag! I picked up three issues of Hawkworld -- #22, 30, and Annual 3 -- for fifty cents apiece. I already have the majority of this series, and these three issues leave me with a single issue left to have the entire run, #29. This series should make for interesting reading. Makes me reconsider my reading/blogging order which I have going on here, but that is a post for another time. My other Hawk-related purchase was a much bigger one, both from a dollar standpoint and a size standpoint. The DC Direct Hawkman and Hawkgirl boxed set features the Winged Wonders in classic DC Direct style. What makes this set so cool (besides the fact that it's Hawkman and Hawkgirl!) is the swappable helmets which allows you to display them in either Golden Age or Silver Age style! Pretty snazzy, and hopefully I'll get the chance to open this (along with the long promised Hawkgirl vs Gentleman Ghost two-pack...) after the holidays. I did leave one item behind which I considered buying. At three different booths, I found very clean copies of Hawkman v.1:no.5, the second full appearance of Shadow-Thief. And as I went down the line, the prices got cheaper and cheaper! However, I decided to pass, but at some point I might start buying these Silver Age Hawkman books, so watch out! Definitely a fun Sunday afternoon talking and buying comics! So I cruised over to Big Bad Toy Store this morning to check on the availability of my GI Joe preorders (as I have said before, I almost have GI Joe on the brain), and what do I see linked on the front page? Hawkman! So needless to say I had to click through on that, and now I have this cute vinyl Hawkman sitting on my Pile Of Loot, waiting to be shipped to my home (much to my wife's dismay I am sure). I had seen these Funko POP Vinyl figures before, mostly at Target, but never had much interest in them because I don't need a funky statue of Captain America or whatnot. But a funky statue of Hawkman? Now you're speaking my language! These guys remind me of Mighty Muggs (another line which was in desperate need of a Hawkman), and both of them remind me of the design aesthetic of the "Super Deformed" sort of candy and capsule toys which are commonplace in Japan, only larger. Since I have a little collection of those as well (both in number and stature), this is not exactly a huge leap purchase for me. Here's to more inane Hawk-merch in 2012! 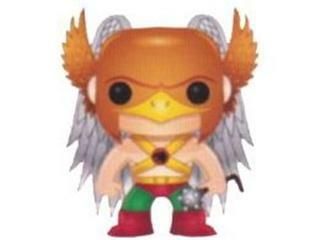 Image: Funko POP Vinyl Hawkman (Artist's Rendition), 2011, image retrieved from Big Bad Toy Store. The Irredeemable Shag sent me these a while ago, and I thought I had posted them but evidently not! So thanks to Bearer of the Honor Wings Shag! Hey Luke! I stumbled across some Batman: The Brave & the Bold temporary tattoos, and they feature both Firestorm and Gentleman Ghost! It's no coincidence to me that Gentleman Ghost, probably the most well known of Hawkman's admittedly obscure rogues gallery, was a breakout bad guy on The Brave & The Bold as well as the only Hawkfoe to get any real extra-media attention, plus the first classic Hawkfoe to pop up in the New 52. Looks like "Gentleman" Jim Craddock will be hanging around for a while! 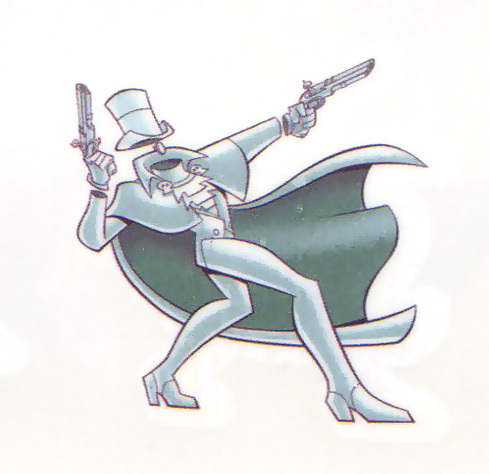 Gentleman Ghost's design from the show was clean and sleek, not unlike his appearance in Justice League Unlimited. His classic look is very straightforward so there is not really much you need to do to jazz it up. The logo is clearly a play on the TB&TB logo, not something I would normally associate with the Ghost, but I like the color. You can also check out Shag's own superhero site, Firestorm Fan, for the latest on DC's Nuclear Men! Image: Gentleman Ghost Temporary Tattoo, 2011, image provided by The Irredeemable Shag. Imaginext Hawkman... Just Out Of Reach! Target, why do you torture me?! I was at Target yesterday and took this photo of their Imaginext display case, a plastic half cylinder which holds all of the Imaginext people you can buy... along with some you cannot, like this Hawkman! Arrgh! It's RIGHT THERE! LET ME GIVE YOU MONEY FOR IT! 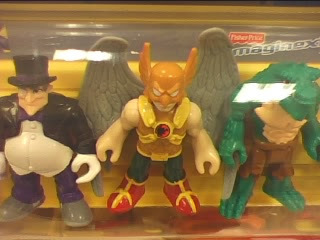 Image: Imaginext Hawkman, 2011, From my cellphone. Got my box from DCBS this evening, which means it's time for Savage Hawkman #3! This issue plays "middle chapter" as the players move around the board for the finale. This is alright, though, because we finally get some answers to a few questions! Not all of them, but some of them, along with some other questions being raised (of course). Overall a lesser issue than the first two, but I enjoyed it. Tan's art continues to look great, and Daniel's story is nicely paced and informative without being data dump. All in all I am still jazzed about this story and can't wait to read the big finish! A more detailed review to come! Well folks, my box from DCBS has shipped, which means I should have my copy of The Savage Hawkman #3 in my hands shortly. As previous, I would expect a quick review followed by a more in-depth post. Very much looking forward to this issue and seeing where things go from where we were last time! A lot of folks on the Internet seem dead set on declaring the New 52 a failure or otherwise point out the mistakes which DC has made. And don't get me wrong, there have been some big stumbling points so far on the relaunch. But on the other hand, the New 52 has reignited an excitement in me for characters who I had either cooled on, were reading more out of routine, or never really considered. I mean, I am excited every month for a new issue of Wonder Woman and Hawk & Dove! The Flash is firing on all cylinders again in a way it hasn't done in almost a decade! Aquaman is one of the best selling comics on the stands! There are two new, monthly War comics! For all the things DC is getting wrong, I swear to Synnar that they are getting a lot of stuff right as well! Sometimes it pays to take off the cynical cap for a while and put on your mark out hat, folks. In the waking world, amid a rally in support of Hawkman and Hawkwoman, a meeting of the Midway City Museum board of directors is taking place, with Joe Tracy leading the opposition to the Halls and George Emmett marshalling the defense. Also in attendance is Dawson, whom Carter has suggested be his replacement should he be asked to step down as curator. The meeting is interrupted by Gerald Trent, newspaper tycoon and father of the murdered Mavis Trent. He informs the board of his intentions to sue the museum for liability in the death of his daughter, unless the Halls resign. The board calls for a vote and the non-members must leave, leading to a confrontation between Joe Tracy and Carter in the hallway, with Carter berating Joe for how he is ruining the memory of Mavis by drinking himself into a raging stupor. The Hawks wing off to get some air, where they discuss leaving Midway City to more effectively battle the Thanagarian invasion. Meanwhile, a Thanagarian plot is underway. While the spy Coral ropes Dawson to the basement, three Thanagarian agents move on the board room. In the basement, Coral shows Dawson a Mithra Meteorite, which will turn him into Lioname. Dawson resists, but is forced to touch the meteorite by two Thanagarians, and transforms. But, the beast is uncontrollable, and he rips apart the two alien toughs. Upstairs, the other three agents force themselves into the board room to kidnap Emmett, but the old man puts up a fight, taking out two of them before he is subdued. Lionmane rages upstairs right as the Hawks return. Joe Tracy is freaking out because Coral was downstairs with the creature, and runs off to find her. The Hawks fight Lionmane, but he gets stronger as they do, developing more of his powers until he is able to knock Shayera unconscious. She wakes in a daze, but then finds Hawkman with a spear jammed into his chest! Review: Wow! After the silly fun of the previous issue, this one is back into the main story with gusto. I really dig what Isabella is doing here with the main plot. The idea of "superheroes creating an unsafe environment" is cliche now, but seeing it put to such effective use as far back as 1986 is indictative of where DC was in this Post-Crisis era. The use of Gerald Trent is a nice touch as well, because we as readers can not only understand his position but sympathize with it as well (same as Carter does, for that matter). Lionmane is a suitably savage villain and him being used as an unwitting -- and unwilling -- pawn of the Thanagarians is a nice mix of old and new. I have maintained for a while that he would be a great modern foe for Hawkman and this story just reinforces that. And you can't beat a good cliffhanger. The art is something of a mixed bag, as has been the norm for this series. Howell's pencils are concise and clean, but they are not really helped any by Don Heck's inking. They are not hurt, either, as Heck's work brings a sort of 60's Marvel aesthetic to the artwork, especially in the board room sceces. It's perfectly good art for the story though. 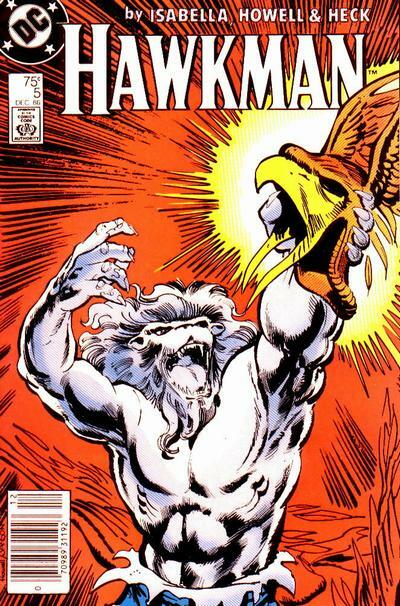 The cover has a sort of Barry Windsor-Smith feel to it, as if Lionmane was fighting Conan or something. Another note about the cover: Lionmane is colored white, making him more like the Wendigo than anything else. In the pro-Hawks protest outside the musuem, someone is holding a sign which says "Free The Kirby 8000!" That's a stumper to me, anyone out there have any thoughts? Image: Hawkman v.2:no.5, 1986, Richard Howell.